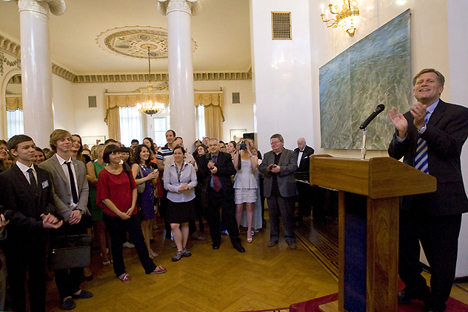 Last night I hosted a farewell reception at Spaso House for a large group of Russian students and scholars who will travel to the U.S. in summer/fall 2013 on U.S. Government-funded exchange programs. This year we honored 300 Russian exchange scholars and students who very soon will be embarking on their academic journey to the United States. I love these events, because they remind me of my own student days and the pivotal role that international exchanges played in my academic and professional development. I was fortunate to be an exchange student myself at Leningrad State University in the summer of 1983. It was CIEE that brought me. That was my first trip ever abroad. I then returned the Soviet Union in the winter of 1985 as a language student at the Pushkin Institute sponsored by ACTR – American Councils for Teachers of Russian (today known as American Councils). I then returned as a graduate student as a Fulbright scholar at Moscow State University in 1990-1991. These experiences changed my life and set me on a career path which eventually took me to the White House in Janaury 2009 as a Special Assistant to the President for Russian and Eurasia Affairs. Three years later, I returned to Moscow, this time not as an exchange student but as the U.S. Ambassador to the Russian Federation. I am deeply grateful to CIEE, ACTR, and Fulbright for helping me get to where I am today. Over the past two decades, the U.S. Government has devoted a considerable amount of time and effort in creating a new foundation of exchange programs with the people of Russia. In fact, over 50,000 Russians and Americans have participated in these programs through the years. Our exchange programs are absolutely essential for the Russian-American relationship for two reasons. First, Americans believe that the best foundation for relations between countries is sustained personal contact. Second, in the last 50 years, the world has become exponentially more integrated, politically and economically. Exchanges provide a foundation of mutual understanding for this new world. This year marks the 40th anniversary of the Fulbright program in Russia. Our exchange cooperation started with the Fulbright Scholar Exchange in 1973-1974, and has significantly grown over the past four decades. In total, 1,740 Russians and Americans have participated in the Fulbright Program in Russia, and the experience has enriched their lives and careers. It has expanded to include the Graduate Student Program, Fulbright-Kennan Fellowship, English/Foreign Language Program, and Russian International Education Administrators Program. Fulbright grants are now offered in all academic disciplines, including the sciences. The Fulbright Program is the largest, oldest, and most respected U.S. academic exchange program. It is hard to overestimate its role in promoting lasting connections between the U.S. and other countries. Some Fulbrighters have told me that the program changed their lives. I know that it profoundly influenced my life and opened new possibilities for me. The U.S. Government also provides other exchange opportunities for over 500 Russian students and scholars annually. High school students can spend an academic year in the U.S. on the Future Leaders Exchange (FLEX) Program, while undergraduate students can attend classes and explore campus life at U.S. universities through the Global UGRAD program. Russian school teachers actively participate in the international Teaching Excellence and Achievement Program (TEA), which provides opportunities to master new methodologies. Young and mid-career professionals develop their professional expertise and leadership skills through the Hubert Humphrey Fellowship. Russian experts in American Studies have an opportunity to deepen their understanding of American society, culture, and institutions through the Study of the U.S. Institutes. Please see the website for more information on educational exchanges. The Embassy also provides resources to Russians who want to study in the United States through our network of EducationUSA advising centers. First published in Michael McFaul's blog.